Fino Restaurant opened in 2003 and became one of the first restaurants in London to offer a contemporary brand of Spanish tapas. 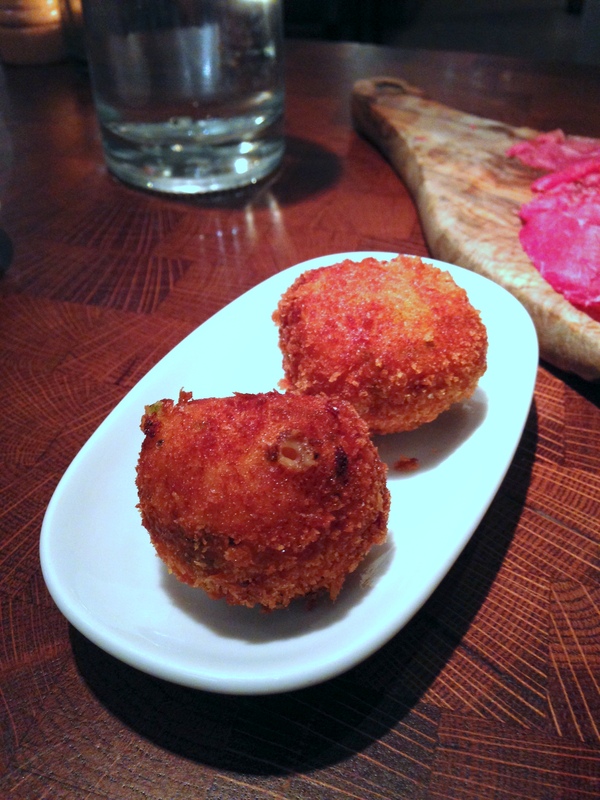 Others followed, but Fino has managed to carve out a niche as an oldie but a goodie on the London tapas scene. Fino comes from the hands of Sam and Eddie Hart, the well-known restaurateur brothers that also brought the critically acclaimed Barrafina to London. The original branch of Barrafina opened on Frith Street in Soho in 2007 and went on to won a Michelin star in 2014. A second branch of Barrafina also opened on Adelaide Street last year. Fino’s Executive Head Chef is Nieves Barragán Mohacho who originates from the Basque country. Her menu changes daily, drawing on influences from not only the Basque region but from throughout Spain. The Fino menu makes for a tempting read, interspersing modern influences among much loved Spanish classics. Fino has an address on Charlotte Street although the entrance itself is located on Rathbone Street. From here, diners are led to Fino’s restaurant and bar area in the basement. The interior is contemporary and boasts of a relaxed ambience. It is also spacious and well laid out, which unlike the tiny spaces of both the Barrafinas, would accommodate large parties well. 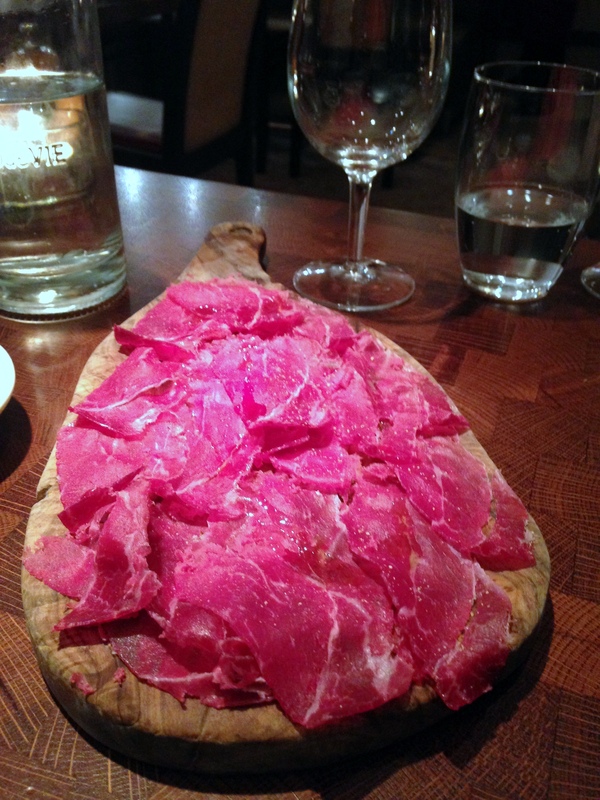 We tried the Cecina de León (£9.80), a smoked and dried beef which was maroon in colour. It was juicy with a strong character and a slightly fibrous consistency. Lightly salted and with small bits of fat running through it, the beef was delicious. I almost always choose croquetas and tortillas when eating Spanish tapas, and at Fino they have some interesting options such as the prawn and piquillo croquetas (£6.50) which were scrumptious. Crispy on the outside, they contained a creamy filling packed with flavour. 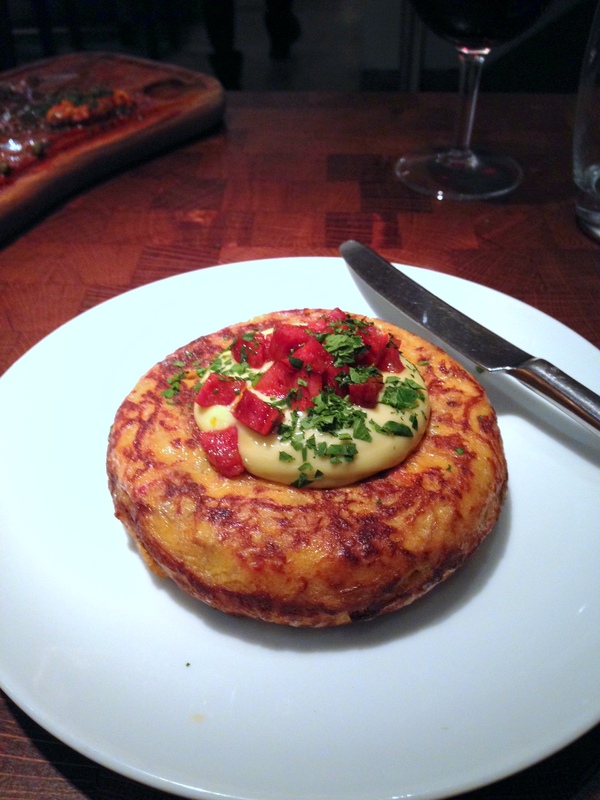 As for the tortilla, we went for the chorizo and alioli (£8.60) option. It came with a gloriously runny centre which was really appetising. I also liked the fact that it deviated from the hard-set centre of the more traditional tortillas as the runniness provided an interesting contrast. But what let the tortilla down was the fact that it was extremely salty. The chorizo was naturally salty, and this should have been taken into account when seasoning the dish so that the correct balance was struck. 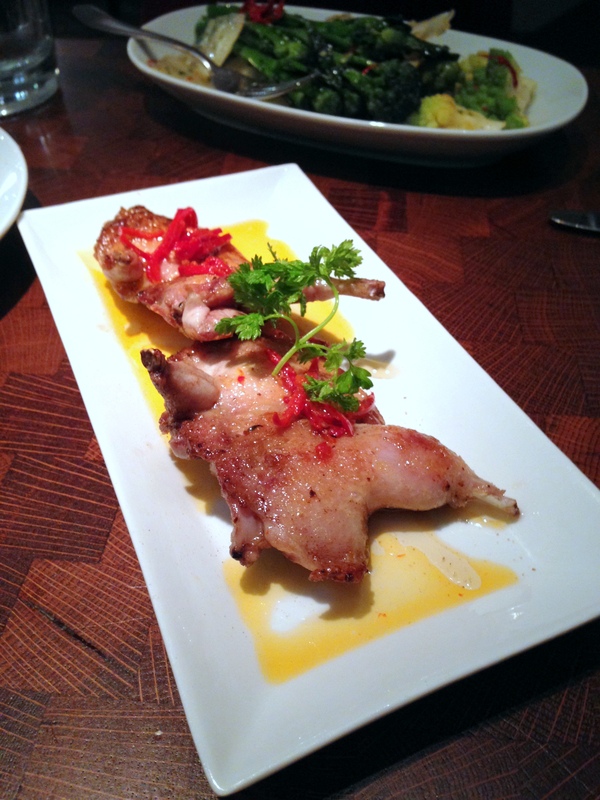 Grilled quail (£8.50) was pleasant tasting although I would have enjoyed it more if it had been pinker, juicer and with a crispier skin. A plate of grilled octopus (£12.80) was fabulous however. The octopus was tender and flavoursome, and the use of capers as accompaniment was well-judged. 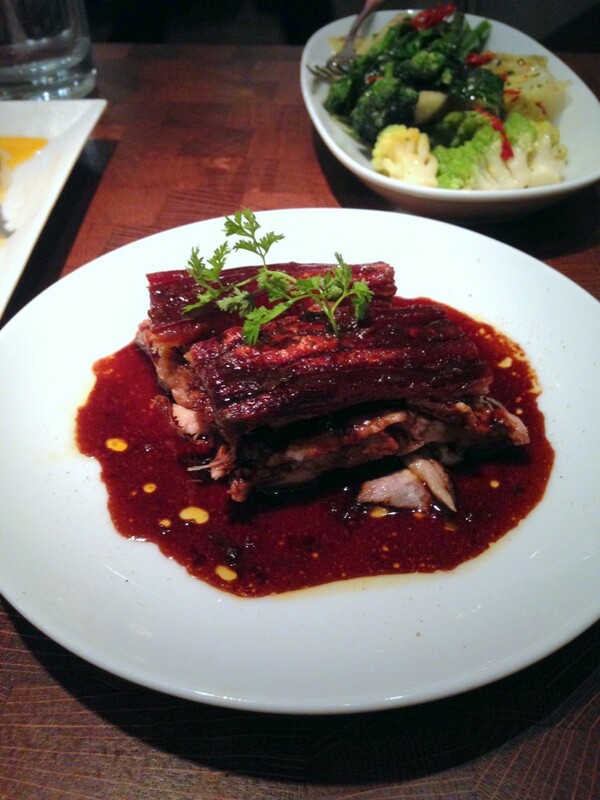 A plate of crispy pork belly (£12.80) was a car crash. The crackling was burnt and the meat was dry which was surprising for pork belly. Obviously too high a temperature had been used in cooking the pork. I hated this dish, not only because it didn’t taste great, but also because it showed up so much carelessness in its execution. And why the kitchen chose to send out a plate of food so obviously burnt was something I could not understand. 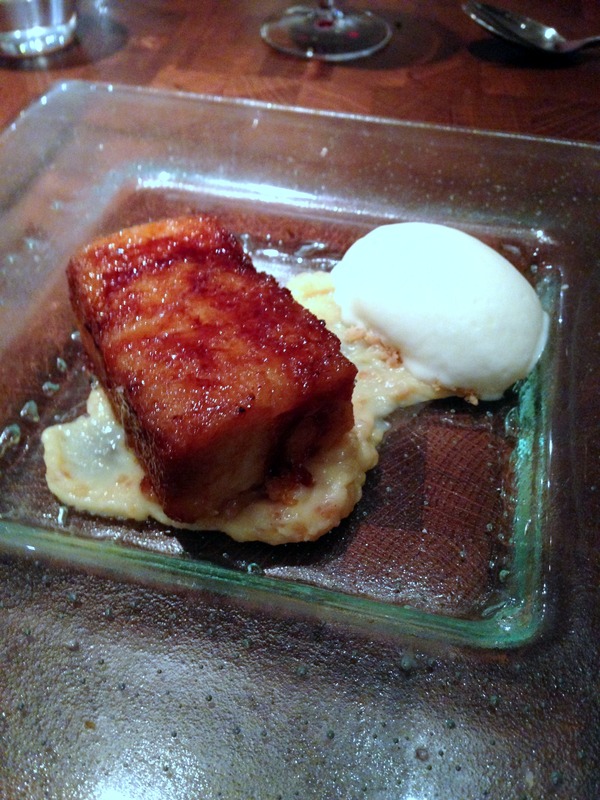 Torrijas (£6.50), a traditional dessert made from bread soaked in milk and then fried, was really delicious. There was a nice caramelisation on the bread, and the result was an exterior that was crispy and lightly sweetened, and a centre that was soft and mellow. It was perched on a base of almond cream with a side of ice cream, both of which served the pudding well. It all became a little sweet on the palate after a while, but overall it was a really enjoyable dessert. Fino doesn’t have the finesse of Barrafina, but we found some really tasty dishes that demonstrated sound technical execution. So ability wise, Fino showed that it could be a 3.5/5 restaurant when it comes to the food. But what let it down were bouts of carelessness that meant the standard of the cooking was also inconsistent. On the night it deserved only 3.25/5. As for the service, we liked our waitress, but she lacked both assurance and knowledge about the dishes on the menu. 1) Some really good plates of food such as the croquetas, the octopus and the Cecina de León. 2) The space is idea for large groups. 1) The burnt pork belly which was a disaster and the overseasoned tortilla. Conclusion – there was inconsistency in the kitchen. 2) The service could have been more knowledgeable. Prices: About £30 to £40 for food. Excludes drinks and service. Fino sounds like a great place. 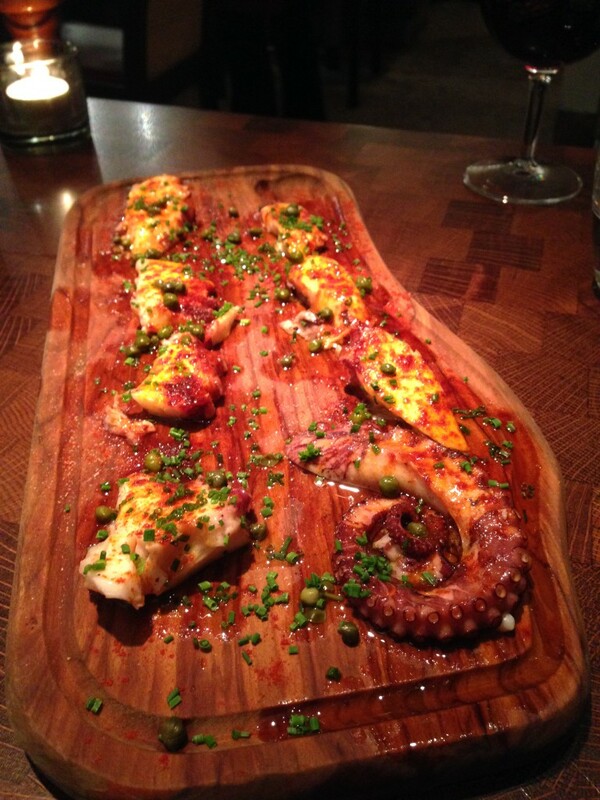 That Cecina de León looks tasty, and that octopus looks so delicious! It takes skill to cook octopus perfectly, and if you’re showing it in your blog, then that just means it was perfectly done. Too bad for the pork belly, though, but at least you got a really good dining experience. Thanks for sharing your review!